LINDADADA: Aqua rine Bath sea salt! Aqua rine Bath sea salt! Do you know adding salt to your bath water can help in soothing fatique and hydration? The texture of the salt also serves as a great exfoliator. Aqua Rine carries a series of bath salt with these benefits and more. 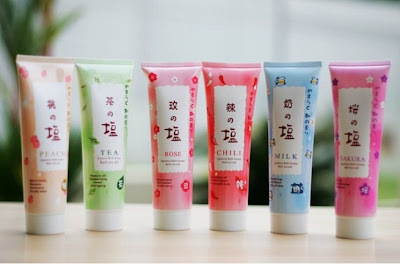 They’re formulated with Sakura, Milk and even Chilli essences, to give you added benefits. Available in fine salt and coarse salt, these products retail at Watsons, Sasa. Prices range between $9.80 and $10.80. Join facebook page, www.facebook.com/aquarine , for more details! For travel size packet only at $1.90 @ watsons! For Fine salt, a mild scrub which dissolve easily when skin wet. For Coarse Salt , allows you to scrub longer. I tried my Milk Bath Salt(Coarse Salt), both on face and body. No irritation! I used it 4 times a week. It's a super huge tube man! Can last very long. My second tube, Peach Fine Bath Salt. Very mild scrub, gentle on skin. Helps in detoxing and smoothing skin. Oh ya! The salt might sting a bit if there's cut or wound on your skin. Grab your travel pack sample at $1.90 from THESAMPLESTORE! Considering a Sakura Bath salt for whitening?! HEE HEE! Im finishing my 2rd tube soon.